Passengers agree. They want safe travel with guards who are trained to deal with safety-critical incidents. 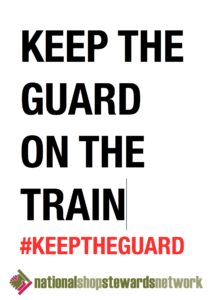 Recent reports showing a 17% increase in violent and sexual assaults on trains, are backed up by the union’s own survey of guards showing 98% nationally have dealt with anti-social behaviour, and 50% of guards have dealt with such incidents on more than 20 occasions. Dissatisfaction among the travelling public with private rail providers is growing by the day as fares rise on overcrowded trains that are more frequently cancelled. Almost a quarter of passengers into London have to stand during their journey. Complaints over South Western Railway’s (SWR) operating performance led to a government inquiry and calls for renationalisation. This dispute is rapidly becoming a political test for the policy of privatisation favoured by the Tory and Blairite Labour governments of the past. With rising fares and failing services at a time when government subsidies to the rail network have quadrupled, it is no surprise that questions are being asked as to the profits being made by Virgin, Stagecoach and other train operators. Rail privatisation is characterised by a failure to invest and develop an affordable, modern, environmentally friendly, safe, integrated public transport system. Support for renationalistaion of the railways stands at 76% and was a hugely popular part of Jeremy Corbyn’s election manifesto last year. Disappointingly, however, Corbyn’s promise is currently limited to nationalising rail companies only when the franchises expire. The task now is to mobilise maximum support for the RMT strikes, linked to the need for an immediate general election to end Tory austerity and privatisation. The Trade Union Congress needs to reflect this and mobilise support for the RMT strike action. A campaign of coordinated wider industrial action to maximise pressure on the government and the call for a million strong march to mobilise support for an immediate general election could bring this weak and dived Tory government to its knees. If this was linked to the demand for the immediate renationalisation of the railways, with compensation paid to shareholders only on the basis of proven need, Corbyn could win. Nationalisation of the railways must be developed with the full democratic involvement of railworkers and their unions, alongside the travelling public. It’s on this basis that the ailing infrastructure can be improved and a 21st century service delivered to meet the needs of society, safety and the environment, not the profits of a few. 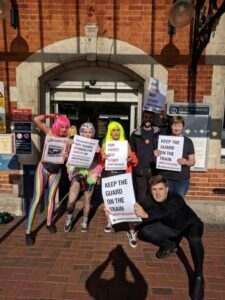 Members of the Socialist Party and supporters of the National Shop Stewards Network organised a ‘Solidarity Saturday’ to discuss with passengers about their concerns. It shows that passengers have had enough and want an end to the chaos, cost and underinvestment of private rail. Campaign stalls were held in Salisbury, Winchester, Southampton, Portsmouth and Basingstoke. “Many people were concerned about the safety of women travelling on late-night trains and asked who would help the disabled passengers – especially as the smaller stations on the Salisbury line were unmanned late at night. “The people who stopped to talk to us were overwhelmingly in favour of renationalisation of the railways. They were fed up with paying the very high fare prices for a service that is getting worse. We were giving out ‘Save the Guard on SWR’ badges. 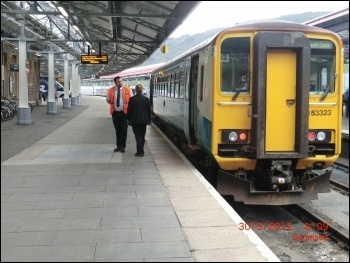 With driver-only operation disputes continuing on Merseyrail, Northern and SWR, an RMT delegate conference of guards to discuss coordinating the action in these disputes would help to strengthen the campaign. 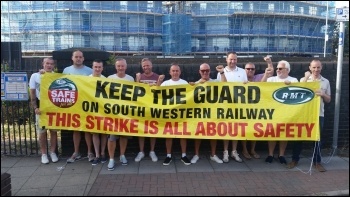 RMT guards on SWR have shown enormous determination to fight for safety. 88% voted for further strike action in the last ballot. 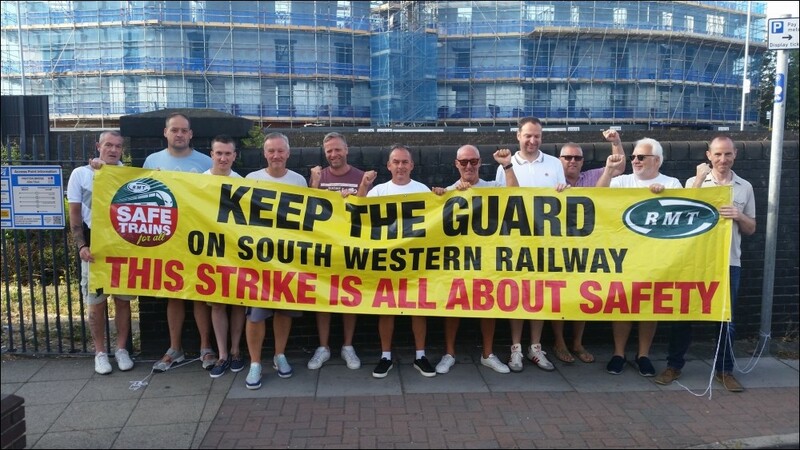 The five-day strike on SWR – the rail network’s biggest franchise – is a serious escalation of this battle and raises important questions about how this fight can be won. The strike is taking place on 23-27 October with four more one-day strikes in November. “Branch recognises the progress made in Merseyrail management conceding the principle of a second person on every train, but notes with alarm that there is no commitment to this being a safety-critical member of staff. Branch notes that this is to be discussed in negotiations. Branch resolves that should negotiations have failed to reach agreement on retention of a second safety-critical member on staff on every train, by late November, then we call on the national executive committee to name the dates for a series of strike days in December. Striking RMT members on Northern (Arriva) rail organised a picket line in Huddersfield on 20 October. They were buoyed by solidarity support from South Yorkshire miners backing the Hillsborough Justice for the 96 campaign. There were also representatives from the Orgreave Truth and Justice Campaign. This all coincided with the premiership match between Huddersfield and Liverpool that afternoon, when Huddersfield and Liverpool fans stood together in common solidarity against injustice, inequality and exploitation. The RMT strikes will continue every Saturday against driver only operated trains for the next three weeks and possibly until Christmas.